Consider the situation. She’s pregnant. It isn’t going well. The docs restrict her to bed rest for 10 weeks. To pass the time she sketches dresses, a lot of them. Their son is born but well below an ideal weight. There are challenges. There’s not a lot of money in the bank. But here’s how husband Lance Stokes saw it. His wife Lauren, a nurse by training, had an obvious passion for design, so why not just go for it and launch a women’s apparel business. 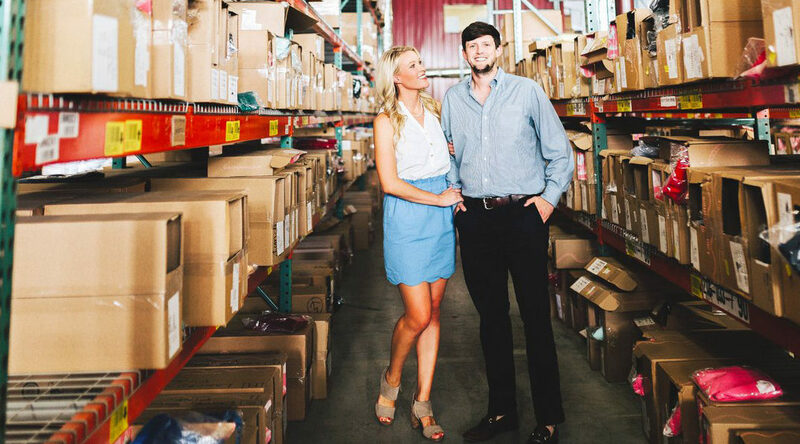 And so they did, naming the company Lauren James, after her first name and their son’s middle name. It was 2013. They proceeded to move out of their own home so they could rent it, and moved into the basement of her parent’s home, out of which they would also run the business. It was bootstrapping at its best. Fast forward to 2017. The company has blown up to over $13 million in sales and some 100 full-time and part-time employees. In September they landed #53 on Inc. 5000 list with a three-year growth of 6,010%. Not too shabby. “I’ve been an entrepreneur since I was very young, whether it was hustling Beanie Babies or Pokemon cards. In high school I built a decent size lawn mowing business and had a car detailing business on the weekends. So I think the stress of building businesses and having your own fortitude of going after something, I think I was conditioned a little bit more than some entrepreneurs who took their first shot later in life. There you have it. Thick skin. But clearly being an entrepreneur was in Stokes’s DNA too. OK, we poked him to see if having his wife as a partner added some stress. He admitted they both can be obstinate, but they both bring different skill sets and have defined responsibilities. Turns out, fully knowing your partner is a benefit. There’s a lot that can go unspoken because they know where each other stands and what they’ll do. Kind of telepathic, if you believe in that. Talk of money naturally leads to risk. In light of him having a young family, we asked Stokes whether he thought about an incremental business approach to minimize risk. His answer was quick and to the bone. “Incremental is not even a word in my vocabulary. I was like, let’s risk it all, let’s go.” He did allow that now that there’s more to lose, some risk sensitivity is inevitable. But as far as he is concerned, successful entrepreneurs have to be all in. “I think it’s an innate personality trait,” he concluded. At the same time, Stokes has had to learn to bring balance into his life. “A unique challenge has been learning how to have proper balance. I’m really geared in a go-go-go direction, so learning to really listen to Lauren and be a dad, it’s been hard to adapt to.” It also helps that he belongs to a founders group in his area, whose membership includes founders from a variety of fields. He admits, “We’re all a bit odd in our own way.” But their regular meetings make for great therapy when needed. Thick skin, all in, and bull sessions with peers sure seems to go a long way.